What is the 2018/19 PAYE tax code? What is the 2018/19 PAYE tax code? What is the PAYE code from 6 April 2018? What is the PAYE code for the year to 5 April 2019? The basic PAYE tax code is set at 1185L for employees. This gives an employee a personal allowance of £11,850 for the year. This is also called the emergency code. Employees who earn more than £123,700 have no personal allowance and receive an 0T tax code (see below). Employees who earn between £100,000 and £123,700 have their personal allowance tapered away. It is reduced by £1 for every £2 in excess of £100,000. Employees who have claimed the Marriage allowance, by virtue of a low earning spouse have a code with a suffix of M. Those who surrender the allowance have a suffix of N.
Employees who are Scottish Taxpayers have the prefix S. The higher rate threshold in Scotland will be £43,430 in 2018/19, compared with an increase to £46,350 in the rest of the UK. What tax code do I use for 2018/19? Notification of a different code is advised by HMRC. It is advisable to double check with HMRC, and if in doubt check online or phone the tax office. Do not carry forward any week 1 or month 1 adjustments. What is the "emergency" tax code for 2018/19? 1185L is the default code. What is code ending in OT? This means that you are not given any allowances against tax. This is most probably because your employer has probably not been given your starting information, is a casual worker or earns over £123,700. How do I check my tax code? Statistically less than 80% of employees bother to check their PAYE code. It is foolish not to check it. If your code is lower or higher than expected you need to find out why. It may have been adjusted by HMRC to code out underpayments of tax in previous tax years, see PAYE collection of tax debts. If you receive any benefits from employment or do more than one job, or receive investment income and are a higher rate taxpayer you should find that your PAYE code is restricted in some way. If your taxable benefits are not adjusted for on your PAYE code it may be that there is an error or your employer may be payrolling your benefits. Check with your employee first. If you fail to check your code you may pay the wrong amount of tax. Do not rely on HMRC to provide you with the correct code. See How to check your PAYE code. Pensioners no longer qualify for any additional age allowance. Married pensioners over 83 (born before 6 April 1935) may receive the married couples allowance adding up to 869 to their tax code. READ all the latest tax news, case decisions, new legislation and articles in tax and then summarised them for you? Only alerted you to things that are RELEVANT to you? Linked all that information together and also provided you with CPD? 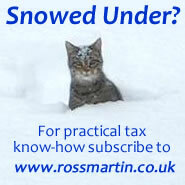 Thousands of firms of accountants and advisers are already using www.rossmartin.co.uk as their primary TAX resource. At a cost of just £1 per day, it’s a no brainer: FREE up your MIND and your TIME (and your wallet). And...we run our Virtual Tax Partner support service, if you need assistance with a particular query or technical issue.